Have you seen families where children have similar features? Ever wondered how that happens? In this science experiment, you will see how genes from the Mother and Father determine a child's appearance. Using the skin toned paper, cut out ovals about 6 inches by 4 inches (15 cm by 10 cm) to be the faces. Print the genetics data table. Print and cut out the dark hair facial features. Depending on how the experiment turns out, you may need 2-3 copies of this page. Print and cut out the light hair facial features. Depending on how the experiment turns out, you may need 2-3 copies of this page. To view and print the pages, you will need Adobe Acrobat (it's free). Flip the first coin to create the genetic profile for the mother. For each Trait listed on the Genetics Data Table, flip the penny twice and write the results in the Mother column using a D for heads and an R for tails. Repeat step 1 using the second coin, to create the genetic profile for the father. At this point, the Mother and Father columns will have a pair of genetic codes that describe some facial features for the Mother and Father. The first coin will represent the gene from the mother and the second coin will represent the gene from the father. Flip the second coin. If it is heads the child will be a boy, and if it is tails the child will be a girl. 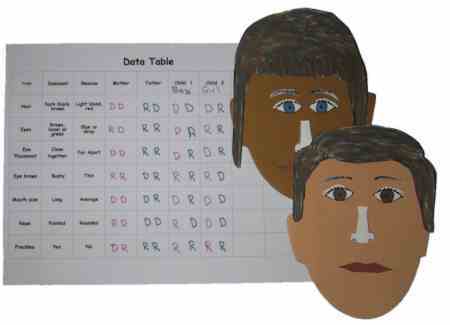 Write boy or girl under Child 1 on the Genetics Data Table. Starting with the Hair Trait, flip both coins. Look at the first coin. If it is tails, take the first genetic code from the mother (D or R) for this trait and write that letter in the Child 1 column for Hair. If the first coin is heads use the second letter from the mother's genetic code. For example: If the mother has the code DR for hair and the first coin flip is a head, write a R in the Child 1 column. Look at the second coin and apply the same rules to the Father's genetic code. That letter will complete the gene pair for the Hair Trait of Child 1. Repeat steps 2 and 3 for each Trait of Child 1. What does the Child look like? Look at the code for Hair. If it reads DD, DR, or RD cut out the Dominate Trait of Hair (dark) from the Facial Features sheet. If the code reads RR, cut out the Recessive Trait for Hair (light). Put it on one of the head shapes, and use a small piece of blue tack to hold it in place. Repeat step 1 for the each Trait. If the child should have freckles, use a marker to draw them on the face. You might want to use a flesh colored marker to color the nose too. Using the same steps to create more children from this set of parents. When you are finished with the first family, create a new set of parents using a second Data Sheet. Use this set of parents to create a new set of children. Each child is created from the genes of the parents. As you create more children, there will be similarities and differences. Most similar features will be dominate genes, while the differences will come from the recessive genes. Learn more about genes in the science topics section.